Happy Friday and Happy July! I am so excited about the long holiday weekend ahead of us! We have 2 picnics, a birthday party, a parade and fireworks on our agenda. It's going to be a fun, busy weekend! I just wanted to take a quick moment to apologize for all the sponsored posts this week. My preference is to only write one per week, but it was one of those incredibly rare weeks where I had 4 posts due within the same week. It was a bit overwhelming! Anyway, here are a few of my favorite things this week! 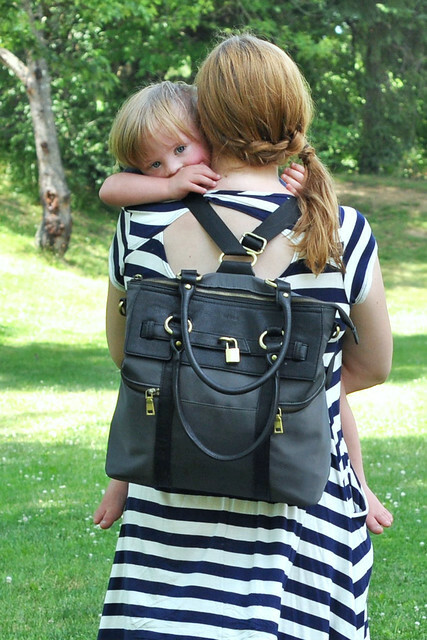 The beautiful Newlie Louise Backpack Diaper Bag! I mentioned that I won it in a giveaway last week. After 2 weeks of using it, I'm in love! It's a backpack, but can easily convert into a handbag or a cross-body bag. It's roomy and stylish, and I love the fact that my hands are free to hold my adorable Toddler Tornado! I do NOT have a green thumb at all! So I'm really impressed by how good my little tabletop herb garden looks! 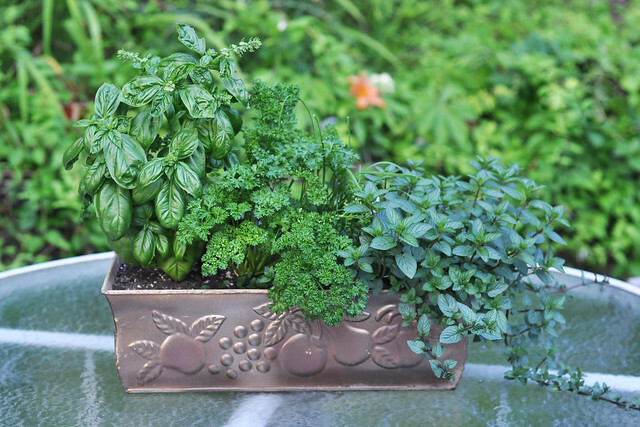 I have basil, chives, parsley and chocolate mint, and it's growing beautifully. I credit good luck because it wasn't anything that I did! I love our weekly visits with my horse! Liam, however, is not a fan. He just calls him "NO" and "BAD" but I'll keep trying! I need this shirt. Because everybody but me is sleeping these days! 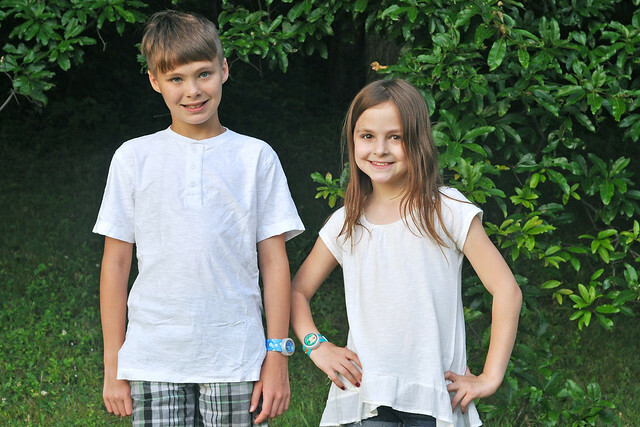 Dylan and Lexie are loving their slap watches from Watchitude! As a mom, I'm a big fan of Watchitude! The watches are very kid-friendly. 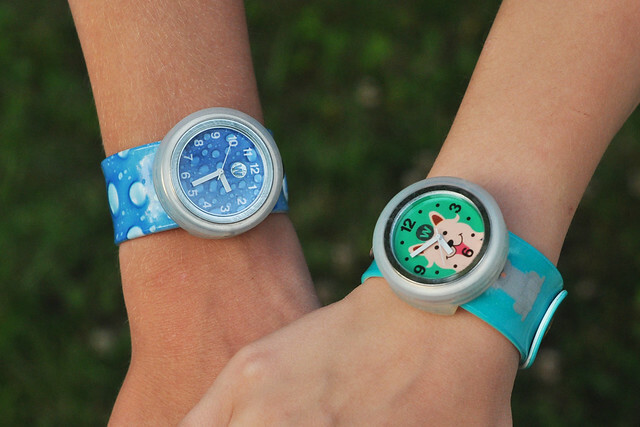 Unlike other watches, my kids can put these ones on all by themselves. It works just like a slap bracelet from the eighties! 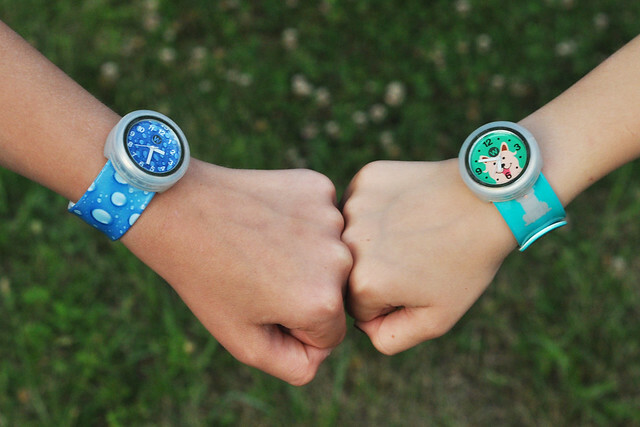 They WANT to wear these watches because they look cool and they go on quickly! An added bonus is the fact that they are splash-proof (not swim-proof). If you're looking for a quality, durable watch for your little one, I highly recommend Watchitude! Lily keeps trying to steal Dylan's watch, so I'm going to have to get her one for her birthday next month! Bunch O Balloons. Enough said. If you have kids, you need this. 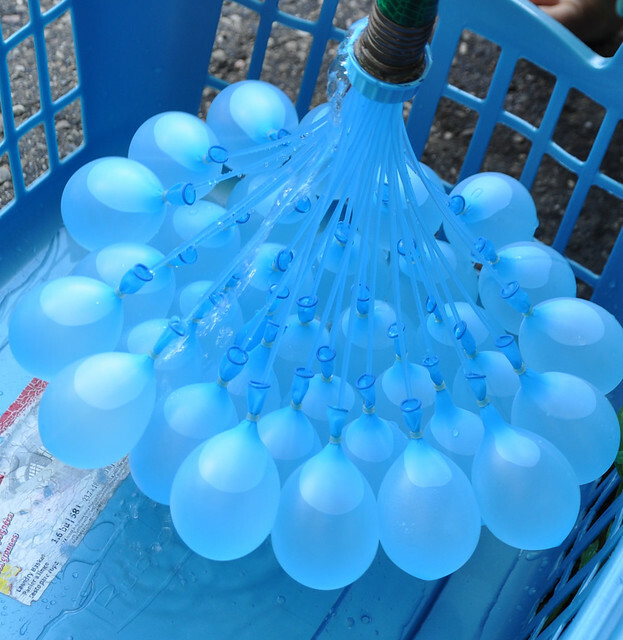 My best friend sent it over yesterday, so we jumped on the trampoline with water balloons! I'm sold! If you have a water table for your child and you're looking for some water table add-ins or play ideas, check out my Water Table Play Activities post on Pittsburgh Mom's Blog! You can read it HERE! I LOVE the fact that Liam is happy 99% of the time. (Obviously when he's away from our horse!) Living with this ray of sunshine is awesome! I hope you all have a happy and safe holiday weekend! What are your plans? Love that diaper bag!! Super cute! Will also need to check out that that water table guide. Yeah, dude. With your 3 hours of sleep you for sure need that shirt lol. It seems like sponsored posts are totally feast or famine! I don't mind them at all. I say good for you! You summed up sponsored posts perfectly! When you get them, they all come in at the same time. I do pick and choose, but it's because I simply don't have enough time to do them all! Ugh, my sleep has been terrible lately too! Hope you get some this weekend! I joke that sleeping + shopping are my favorite hobbies, but seriously. They are. I love that shirt! That's hilarious! Shopping is definitely one of my favorites! 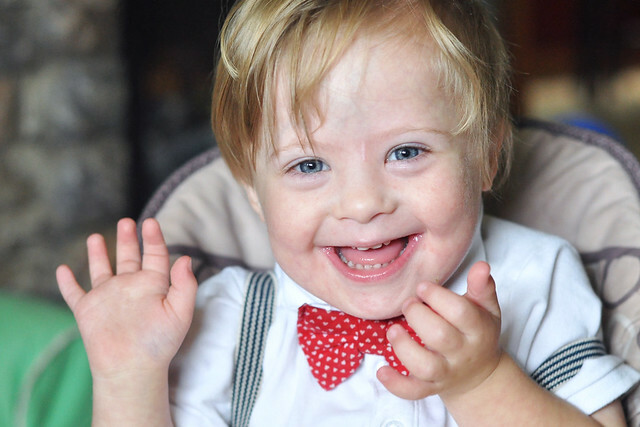 Such a happy baby! And I wish I had had a diaper bag that converted like that, so fun and versatile! Happy 4th of July! We are headed to spend the night at my cousins and then watch fire works with the rest of my family. Should be really fun. I did several collective posts in a row one time and good Lord it was draining. I don't mind them on other peoples blogs either because I know the good it does for ones family. But I also understand the burn out it can cause the blogger too. I haven't done anything for Linqia for a while you seem to work pretty well with them though. Good for you girl. It takes a lot of work, doesn't it?!? I've never worked other sponsored post companies, but maybe I'll give it a shot! The bag is amazing! I love it so much! I know! Somebody made a fortune from that contraption! Haha I have the I'm So Tired shirt and love it! Also love the diaper bag!! we love bunch of balloons too! have the best 4th! Seriously life changing when you have kids! Haha! Hope you had a great 4th of July! That diaper bag is to die for! Fabulous list! Thank you! I love the bag! Love those "I'm so tired" tees, and we're huge fans of those water balloons too! My friend just found bunch-o-balloons in bulk at Costco! I am so buying them! You are one busy Mama these days! I don't know how you find time to blog or do reviews, but you're accomplishing the unthinkable. AMAZING. I love your posts about the watches and the balloons--I need to look into those. 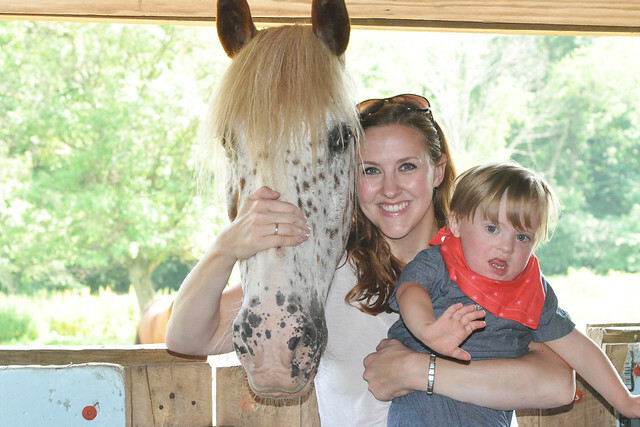 My son is not a big fan of horses either; I still can't get him to sit on one...never-mind riding one. That's funny that he still isn't a fan! I really hope Liam comes around. Equine therapy would be so beneficial for him!